From breathtaking beaches to untouched rainforests, Gabon is a country on the West African coast with a wealth of natural resources. These resources have provided the country with a higher per capita income than many sub-Saharan nations. Gabon's income is not spread equally, however—about one third of Gabon’s population still lives below the poverty line. Because of Gabon’s beaches and lush rainforests, it has established itself as a unique eco-tourism destination, drawing people to see its forests filled with gorillas, elephants and chimpanzees. Around 10% of the country’s natural habitats are protected in national park areas. Despite its natural resources and increasing income, Gabon faces many development challenges, including water scarcity, deforestation and illegal poaching. To develop sustainably, through its participation in the Gaborone Declaration for Sustainability in Africa, Gabon will need to focus on developing a green economy and protecting its natural capital. Gabon sits on the equator and borders Cameroon, the Republic of the Congo, Equatorial Guinea and the Atlantic Ocean. The country is relatively small, with about 250,000 square km of land. The coast has narrow coastal plains with patches of mangroves, which are critical to protecting the coastline. The interior is composed of green hills with the south being mainly drier savanna. The inland hills are covered in wet, tropical forests which are home to exceptionally high biodiversity and many endemic species. The forests of Gabon provide critical ecosystem services such as carbon sequestration and provide fuel, food and timber for local communities. Besides its forests, Gabon is bountiful in petroleum, magnesium, iron, gold and uranium. Gabon is the sixth-largest oil producer in sub-Saharan Africa, which has helped the country’s gross domestic product (GDP). Oil exploration in the area has put pressures on the nation’s natural capital and resources must be managed properly to ensure long-term, sustainable development for Gabon. Gabon’s forests, which cover about 85% of Gabon’s land surface, are important to many national industries such as logging, mining, oil extraction, and national parks and eco-tourism. The country has put in place good forestry legislation (Law 016/01, the Forestry Code) to protect its forests, but enforcement is often times weak. Proper management of Gabon’s forests is key to ensuring they can be efficiently used by all of Gabon’s population. 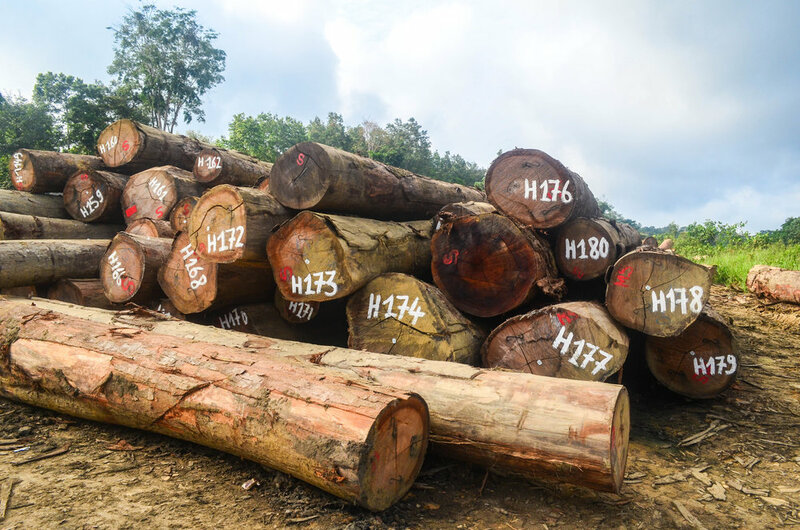 The forestry industry in Gabon is second only to the petroleum sector in export earnings, and makes Gabon the largest exporter of raw wood in the region. The logging industry started the process of deforestation in Gabon, and paved the way for other sectors to contribute. The construction of logging roads has opened up forested areas to exploitation by oil companies, palm oil farmers, poachers and miners. The Government of Gabon understands the important ecosystem services that its forests provide and has declared it will take steps to conserve its forests, including working on sustainable forest management and supporting community-based forest management. The oil and mineral reserves in Gabon have boosted the country to upper-middle income status, and made it one of the wealthier countries in sub-Saharan Africa with a per capita income four times that of the average. A large portion of the population still remains below the poverty line though, due to high income inequality. Timber and manganese were the main contributors to the economy until oil was found offshore in the 1970s. Now oil contributes to about 50% of GDP. Services and industry make up almost half of GDP with agriculture’s portion being 3.6%. The main industries are petroleum, manganese, gold, lumber and cement. Natural capital contributes to a significant portion of Gabon’s economy. Working in parallel to Gabon’s Plan Strategique Gabon Emergent (PSGE)’s Green Gabon pillar, the Gaborone Declaration for Sustainability in Africa’s Secretariat will support Gabon in sustainably developing the country’s natural resources and working towards a green-economy. With support for the Gaborone Declaration Secretariat, Gabon will focus on building support in sustainable production, natural capital accounting, environmental-economic monitoring and private sector partnerships. The Secretariat will help Gabon to set its Gaborone Declaration priorities and work towards the Declaration’s goals and objectives. Gabon has demonstrated its commitment to protecting its environment and natural resources through its participation in many conventions such as the UN Framework Agreement on Climate Change and the Kyoto Protocol. Gabon’s national strategy, the Plan Strategique Gabon Emergent (PSGE) has three pillars to strengthen the economy, one of which focuses on developing a “Green Gabon” to sustainably manage the nation’s resources. The focus of this pillar is reducing carbon emissions, sustainably growing the timber industry and achieving food-sufficiency through sustainable agriculture. The Government of Gabon also aims to improve transparency and law enforcement for natural resource management through the World Bank funded Forest, Fisheries, Biodiversity and Environment Sector Program (FESP). The Gabonese Ministry of Economy, Employment and Sustainable Development has designed a framework to ensure that communities will be taken into account during project implementation to ensure that local communities develop sustainably while resources are protected.. When signing the Gaborone Declaration, Gabon vowed to “integrate the value of natural capital into national accounting and corporate planning and reporting processes, policies and programs, in agreed efforts, including the appended Communique on Natural Capital Accounting.” In conjunction with the UNEP, Gabon has started to translate forest-related ecosystem services into national accounts using the System of Environmental- Economic Accounting (SEEA). Gabon is also party to the 50/50 Campaign which is a World Bank initiative to get 50 companies and 50 countries to support natural capital accounting. Building off this strong base, the Gaborone Declaration’s Secretariat will be able to support Gabon in completing its national natural capital accounts. As part of the national strategy, PSGE, the Government of Gabon seeks to engage in public-private partnerships to initiate sustainable development in the country. Some examples of these partnerships are: the Gabon Special Economic Zone (GSEZ) which aims to promote sustainable production and processing of timber; the Grande Mayumba Development Company which focuses on sustainable forestry, agribusiness, fisheries, ecotourism and infrastructure development; and Ireland Blyth Limited which aims to improve Gabon’s seafood and maritime industry. The PSGE has developed a framework for which more public-private partnerships can be developed to further Gabon’s sustainable development and green-economy. Ten percent of Gabon's natural habitats are protected in national park areas. Forests cover approximately 85% of Gabon's land surface.